The social help that Atty. Alvaro Noboa gives day after day to Ecuador is reflected on the different areas where he contributes. Each day, at the Customs of Guayaquil, the main ecuadorian port, tons of shipments arrive with many different purposes: trade, commerce, medicines and general commodities. Once a year, however, a container arrives with hope for those who are in need. The sender is Guayas-Ecuador Hilfe e.v, a German organization that, for several years, has counted with the financial aid of Atty. Alvaro Noboa for the transportation of those containers that provide help to different organizations around the country. Crusade for a New Humanity Foundation works with the philanthropic aid of Atty. Alvaro Noboa along with the German organization. Dr. Jenny Arteaga, Health Plan and Banana Plan Director for Crusade for a New Humanity Fundation, has been working for more than 10 years along with many other helping hands of volunteers. Noboa helps Guayas-Ecuador Hilfe by warehousing the German containers that will be sent to Guayaquil and also financing the legal paperwork in both of the country’s Customs. The containers financed by Atty. 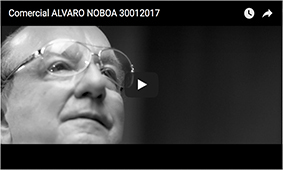 Alvaro Noboa provide with medicines, wheelchairs, computers, first aid stretchers, and prosthetics among other items to foundations and organizations that offer social help in the country. Cariño Foundation, Melvin-Jones Foundation at canton La Libertad; Madres Doroteas Foundation from Ballenita and The New Humanity Crusade Foundation are some of the organizations in charge of distributing the goods that arrive in the containers. According to Mrs. Silva, one of the representatives of Health Plan and Banana Plan for Crusade for a New Humanity Foundation, said only this year the Foundation gave 200 computers to the Philanthropic Society of Guayas. This equipment will be used to instruct students on technical careers. In addition, the Foundation delivered over 125 especial beds to the Ecuadorian Red Cross for people in critical condition, as well as hydraulic beds requested to the Foundation. The Crusade for a New Humanity Foundation also presented wheelchairs and school desks to schools that work with foundations that help poor people. The Health Plan of the Foundation finances many of these activities. Hard work by entrepreneur Noboa does not end with just health programs, since it also covers nutrition plans for elders and children. Sonya de Silva says this help has been provided since 1999. The Foundation is in charge of the bananas distribution to institutions that need it the most. While Padre Damian Foundation helps lepers, New World Foundation provides education to children from Duran. The nursing homes Hogar San Jose and San Vicente de Paul Fundation receive over 200 boxes of banana brought by organized trucks financed by Atty. Alvaro Noboa and once a year other fruits are also given.